The annual anti-racism demonstration marched through central London on 16 March. The demonstration is called to mark the United Nations day against racism. This year the march was a day after the horrific attack in Christchurch, New Zealand, where 50 Muslim worshippers were murdered by a far-right extremist inside two mosques in the city. The demonstration in part was an act of solidarity with those victims and their families. But it did not draw in the huge numbers who could be mobilised to march. This is because, while many of the invited speakers drew reference to the rise in Islamophobia and hate crime to condemn this attack and there was a widespread call to stand firm against the rise of support for far-right populist politicians, how the potential power of the organised working class in the trade unions could defeat racism was not posed. Such a movement, linking workers up with energy of the young people who have taken to the streets in recent weeks, must be built around demands and slogans that unite working-class people in a fight for a decent life for all. The threat of the growth of the far right is a warning to everyone, not just to black or other minority populations, but to the organised working class as a whole. If opposition is not mobilised, then horrific attacks like Christchurch could become more commonplace. The role of the trade unions in organising this opposition is key. However, at the moment, they appear to have delegated this task to Stand Up To Racism, the main organiser of the 16 March event. London United has been formed by unions to mobilise for anti-racist actions. Some unions did have blocks on the march - the Communications Workers' Union and civil service union PCS - while several branches of public sector union Unison brought banners. General calls for unity and challenging the far right will not be enough to build a movement to defeat the far right and racism. None of the speakers said why this is happening or how to defeat it. Some Labour politicians, who are currently administering cuts, spoke. The cuts only contribute to the difficulty in building unity to fight racism. The conditions of economic crisis, austerity and the lack of trust in the political establishment have prepared the grounds where far-right ideas could get an echo. 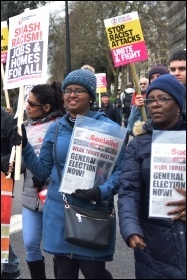 A Socialist Party motion has led to general union Unite and the Trade Union Congress agreeing to a 'jobs, homes and services' campaign. The urgent task for the trade unions is to combine a vigorous campaign against all the worsening conditions workers face with the fight against the far right. This can unite all sections of the working class against racism and austerity.